Download now (free 30-day trial for new users) or update (for current users). February 6, 2004. Flash! Builds your vocabulary by showing the foreign-language word, then showing the English word and asking whether you got it right or not, and keeping track of your answers. What Makes Flash! Pro Stand Out? Vocabulary memorization flashcard software for any language or subject. Flash! Pro tests vocabulary like Flashworks and Memcards: by showing the foreign-language word, then showing the English word, and asking whether you got it right or not, and keeping track of your answers. The best part about Flash! Pro: The degree of flexibility with which you can specify which card you want to drill. For example, I can specify that I want to drill all words which occur in Acts 1:1 to 5:42 with a frequency of over 10x which I have not got right in the last week except those cards which I have got right more than 90% of the time. Or, say you're preparing for a translation quiz on the book of James, but you're only responsible for words which occur over 30x. You can get it bring up all and only those words, and concentrate on those words you're having the most trouble memorizing. Create quizzes and printed cards by exporting to HTML, which can be opened by your word processor. Generate custom “Reader’s Lexicon” files like Kubo and A-B-C.
Write the word to be learned on one side, and the English glosses on the reverse. Tedious and time-consuming, this method can be appropriate for introductory students if premade vocabulary lists are available (e.g., in a textbook). Pros: portable; writing the cards can help memory. Cons: English glosses can be misleading (does ἐκκλησια mean a church building? ); much time is wasted reviewing cards one already knows. This method tends to be used by more advanced students and scholars. Vocabulary lists are generally not available for specific passages, but tools like Kubo for the New Testament and ABC for the Hebrew Bible can be helpful. Cons: a word “learned” this way is not likely to stick in one’s memory unless somehow reinforced. The lexicon work can be time consuming and interrupt the flow of the reading, impairing the literary and rhetorical force of the text. A combination approach: memorize the basic glosses of the words in the primary text, then read the passage smoothly, adjusting one’s understanding of the words to the context. Pros: the flow of the reading is maintained, permitting the literary and rhetorical force of the text to be seen. The reading is enjoyable rather than frustrating! Most computer vocabulary learning programs imitate the first method of learning vocabulary, improving on it by removing some of the tedious tasks by making the cards virtual rather than physical. A card front (the foreign language word) is displayed on the screen, the user tries to remember what the English gloss is, then presses a button, and the English gloss is displayed. The user presses a button to tell the software whether they guessed right or not. Flash! Pro is built on this same model, of course, but does far more as well. Every word in the primary texts is included, right down to the hapax legomena. One can easily choose to learn only those words that occur in the passage to be read. One can concentrate on the most common words in the corpus, learning them first before moving on to the rarer words. 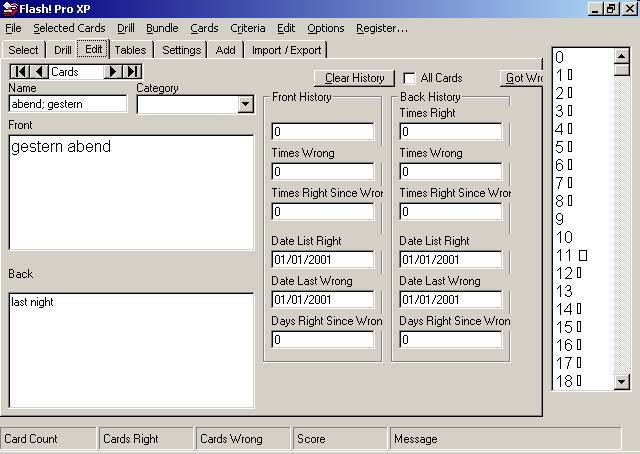 One can edit the cards in the database with any HTML formatting codes. In other words, anything that can be displayed on a web page can be displayed on a card front or back. One can use bold, italics, fonts, sizes, tables, graphics, even sound! For example, Flash! Pro databases come with a pre-defined SQL expression to identify which cards one has been having most trouble with -- which cards one is most likely to forget next. This expression will select for drilling those cards that have not been answered correctly for a period of time longer than the time between the last time right and the last time wrong. Sound complex? Maybe. But one needn’t understand how it works to take advantage of its power. It is extremely effective and efficient, and simple to use! Flash! Pro more than meets the needs of students of introductory Greek, Hebrew, Aramaic, Latin, French, and German. Many of the vocabulary databases for these languages are keyed to standard textbooks such as Mounce, Seow, and Wheelock, so that one can concentrate on one lesson at a time. For textbooks not already supported, users can arrange the cards into their own “bundles” to match their vocabulary lists. More advanced students are often tested by translation quizzes on specific passages. For example, for the PhD Greek requirement at McMaster, every two weeks we were tested on our ability to translate several chapters of Acts. How easy it is to tell Flash! Pro to make a bundle of all 485 words in Acts 1-3, and drill me on the 143 words in that bundle I do not already know, beginning with the most common words, working down towards rare words, all the way to the hapax legomena. By the end of one semester I had learned all 2000 words in the book of Acts. Similarly, in preparation for a French examination one summer, for three weeks I used Flash! Pro to learn 1346 words, spending only an hour and a half each day. That’s one minute per word! At this rate a typical student using Mounce’s textbook would spend less than 15 minutes per week on vocabulary! Flash! Pro is often used to prepare sermons on specific biblical passages. The preacher uses Flash! Pro to memorize the vocabulary of the passage before turning to the original text to read it with relative ease. Without the distraction of flipping to a lexicon every time an unfamiliar word is encountered, the preacher can gain a better sense of the passage’s coherence and logical or narrative flow. The preacher will be more attuned to possible aesthetic or literary devices present in the text, facilitating a more comprehensive understanding of the text. Flash! Pro is not of course meant to replace in-depth lexical work, but it helps the preacher identify which words do merit further investigation. As is the case for preachers, scholars too can benefit from less a tedious reading experience. Even those of us who prefer to read the scriptures in their original languuges (for whatever purpose) do not remember every Greek, Hebrew, and Aramaic word in the Bible. And most of us like to keep up our vocabulary over the years. Flash! Pro can keep track of those words we need to refresh the most, and bring them up for us at the right time. For a free 30-day trial, email me the serial number displayed on your welcome screen, and I will send you a corresponding temporary license code with expiry date. 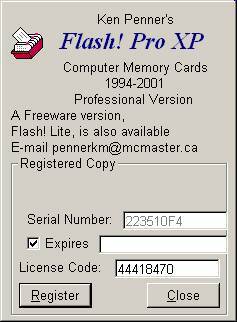 When you are ready to register, send me (pennerkm@mcmaster.ca) your serial number along with your $50 payment through http://www.paypal.com, and I will send you your License Code which will enable the program. Flash! Pro can also be rented for $5/ month. Again, send me your Serial Number and Date you would like your license to expire, and I will send you the appropriate License Code. Download updates, bug fixes, share databases with other users, get your questions answered, tips, tricks, and more! For Windows 3.1; Greek New Testament words occuring more than 10 times.